The Church Of Scientology is bad at Twitter. In the months after the première of Alex Gibney’s Scientology documentary Going Clear: Scientology And The Prison Of Belief at the Sundance Film Festival, and with the HBO debut looming on March 29, the Church has been pummeling Gibney and his subjects through a Twitter account called Freedom Media Ethics. The feed only has around 400 followers—including one Mr. Nathan Rabin, who bows to no one in his Scientology obsession—but Twitter users have been so bombarded with promoted tweets that it might as well be 40 million. Over the years, Scientology has been famously vigorous (to put it mildly) in defending its legitimacy as a religious institution against persistent accusations of cult-like misbehavior. In that spirit, the Twitter feed is intended as a corrective, exposing Gibney as a sloppy, one-sided filmmaker who relies on the testimony of a small group of Church apostates who lack integrity and credibility. They even put the word “documentary” in scare quotes. As the film—and the Lawrence Wright book it adapts—reveals, the Church has been extremely effective in the past at suppressing dissent, intimidating the press, harassing critics, and siccing its lawyers on any person or entity that’s deemed a threat to its First Amendment . At a critical point in its existence, Gibney and Wright argue, these tactics won Scientology the tax-exempt status it currently enjoys, saving it from a billion-dollar tax bill that would have effectively wiped it out. Now, the savings from its non-profit protections, combined with the money it bilks from a membership that’s dwindled to less than 50,000, has given the Church a war chest massive enough to afford an all-out social-media campaign against Going Clear. And it couldn’t be going better for Gibney’s film if he masterminded the feed as a false-flag operation. The fundamental problem with the Freedom Media Ethics campaign is that the Church seems to believe the tactics that worked in the private sphere will work in the public one as well—that flooding the zone with vindictive language, cheap smears, and character assassination will put people in their place. This kind of harassment—often in the form of lawsuits, and sometimes in the form of invasive personal smears—has made it extremely difficult for ex-members or critics to speak out against the Church without suffering the consequences. On Twitter, however, it’s called trolling. In fact, with fewer than 500 followers and a constant stream of invective, there’s little separating Freedom Media Ethics from the average generic-egg-avatar GamerGate mouth-breather. And for an organization that believes itself entitled to the respect given other world religions, that’s an awfully undignified place for it to be. The Church’s strategy on Twitter is to run the feed like a political campaign airing negative ads against an opponent. But in this analogy, Scientology is a deeply unpopular candidate, the ads are shoddily produced, and it comes off looking less than classy. Keep in mind: The Church is ostensibly trying to defend itself against the claims of Wright’s book and Gibney’s film, but it’s so used to being the bully that it can’t even feint at playing the victim. With each and every tweet, jammed into timelines with the persistence of a pop-up MacKeeper ad, Freedom Media Ethics reinforces the vindictive image of the Church that Wright and Gibney lay out in such scrupulous detail. The primary mode of attack is to go after Wright and Gibney’s interview subjects one by one, assigning each a broad label: “A Violent Sociopath,” “The Wife Beater,” “The Home Wrecker,” “The Drama Queen,” etc. And all come attached with the blurriest and least flattering photographs they could dig up: One giving the middle finger, another grabbing his balls, and a third not looking model-perfect in a two-piece bikini. Even Gibney himself is made to look like the proprietor of that creepy adult bookstore just off the highway. An organization with handsome movie stars like Tom Cruise and John Travolta as their public face is trying to imply that these people, so ugly on the outside, must be ugly on the inside, too. What kind of monster drinks Bud Light out of a can? Surely not Tom Cruise! On matters of substance, however, the labels do the Church no favors. Take Marty Rathbun, the “Violent Sociopath,” who was once the Inspector General of the Religious Technology Center, a senior position that involves protecting Scientology’s trademarks, symbols, and texts. In the book and film, Rathbun describes himself as an enforcer who was party to a lot of the Church’s dirty business, like wiretapping Nicole Kidman’s phone in an effort to break up her marriage with Cruise, and using information from “private” auditing sessions to keep Church members in line. He claims to have borne witness to Scientology head David Miscavige engaging in mob tactics and notorious fits of violence, and admits to “slapping around” some people on Miscavige’s behalf. So tagging Rathbun as a “violent sociopath” to discredit his shocking admissions of thuggery on the Church’s behalf doesn’t undermine his credibility. Consider also the case of Sara Goldberg, “The Home Wrecker,” another former elite Scientologist who was with the Church for 36 years before opting to leave over its policy of “disconnection.” She had raised a son and a daughter within the Church, but faced an excruciating decision when her son became disillusioned with Scientology as a young adult, and the higher-ups asked her to “disconnect” with him. Her refusal was a Sophie’s choice: Goldberg’s daughter ended up disconnecting with her, which also lost her access to her granddaughter. The Church spins it as Goldberg picking her immoral, drug-addicted son over her daughter and her special-needs granddaughter, but even if that were the case, that reinforces the fact that Scientology has a policy of disconnection. Which is why she’s in the movie in the first place! 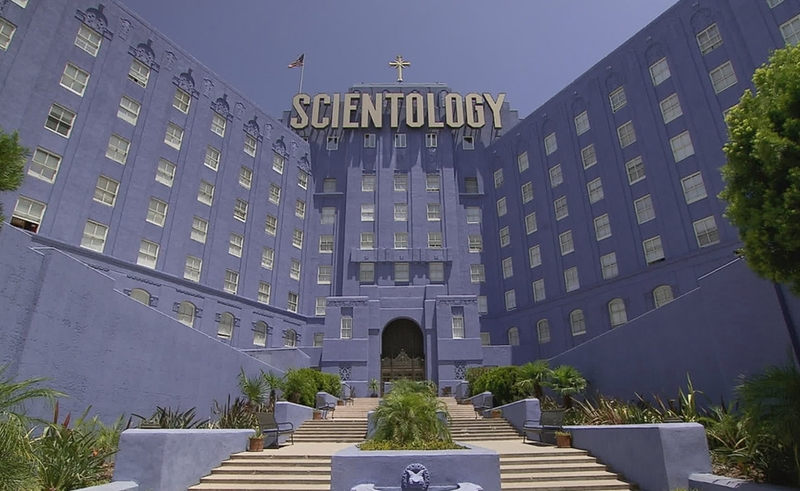 On this point at least, I’m in complete agreement with the Church Of Scientology, despite the aesthetic shortcomings of their own in-house videos, which make for the film’s funniest moments. Gibney’s film is formally bland, thinly assembling the highlights of Wright’s book for an audience that hasn’t gotten around to reading it yet. And they can quote me on that.